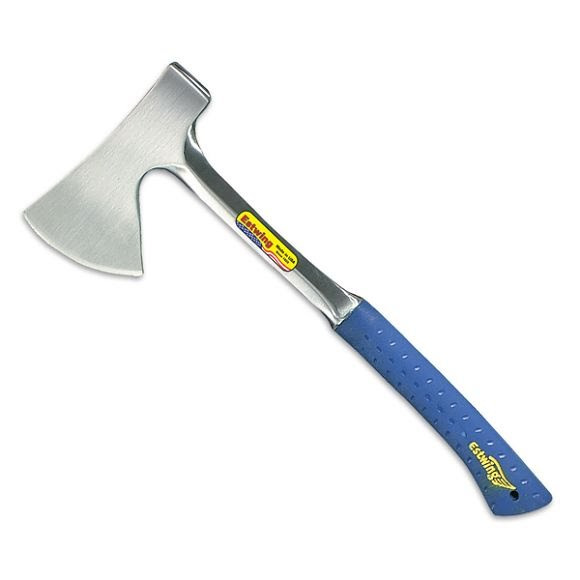 Perfect for all of your camping needs, the Camper's Axe is a great choice for felling, trimming trees and splitting wood. Also works well for notching timbers and driving wooden or plastic stakes. A nylon vinyl handle gives you a non slip grip, and a leather belt sheath is included for easy transport and storage. Perfect for all of your camping needs, the Camper&apos;s Axe is a great choice for felling, trimming trees and splitting wood. Also works well for notching timbers and driving wooden or plastic stakes. A nylon vinyl handle gives you a non slip grip, and a leather belt sheath is included for easy transport and storage.